I discovered my love for two wheels, migraine probably as soon as I was allowed to stray, search I still remember that shiny red tricycle! From there the obsession only got worse, look and before long, I was on my bike every day from a young age. But wait, there are more things that have led to my experiences as a bike racer than life on a tricycle. My real age as a bike race was started when I was highly involved with music. The bassoon, to be specific. I’m a seventh generation musician, and my grandmother, in her youthful 100’s, still writes pieces for me. My musical background took me from my home state of Oregon to the California Bay Area to attend the San Francisco Conservatory of Music following high school. While at school in California, I did like everyone else does there and racing. When in Rome, right? Since I didn’t know a thing about bike racing, aside from not being able to race on a tricycle, I joined a local bay area bike club, Peninsula Velo. What started out as dipping my toes immediately became a head first swan dive. Immediately I knew that I would have to chase this to my highest potential to see how far I could take it, and how hard I could push myself. In the process, I have made many great friends, found amazing experiences and places, and have built a wonderful career around the sport. Eventually I ended up moving to Oregon, after I left the Conservatory and its small confining practice rooms, to attend school at the University of Oregon, where I earned a degree in Economics. It seems the small room that I was confined in at the conservatory has followed me. This time it has disguised as something called a “lab”. Instead of running scales, symphonies and etudes, I did like all good economists and ran regressions. 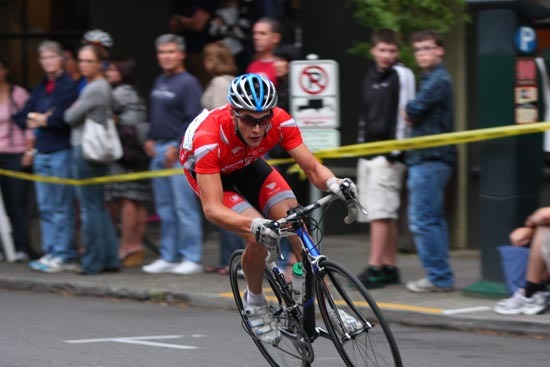 In addition to earning a degree in Economics, I also spent a large part of my time devoted to keeping up on the latest information on training and physiology to supplement my goals as a cyclist. Since graduating college, I have been I spending most of my time training and racing, and coaching riders of all ages and abilities. I am a coach at Upper Echelon Fitness, and work along side great cycling coaches Russell Cree, Evan Elken, Tina Brubaker, Omer Kem, Brian Forbes and Linnea Avord. They are a great group to work with to help offer premier coaching in Oregon. In addition to coaching clients of my own, there is a saying that even a coach needs a coach. My coach and mentor has been Clark Natwick. Clark has been a great help and mentor through out my cycling career, helping to shape both myself as an athlete, and my coaching philosophies. 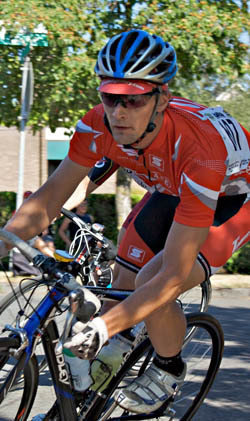 I’m racing with a great group of guys at Team Oregon, a team that has become a top development team in Oregon. In addition to developing riders from new racers to category 1 elite riders, Team Oregon is maintaining one of the best elite teams on the west coast. Keep an eye out for us at an NRC near you! Without all these guys, I wouldn’t be able to chase my dream of winning professional bike races. Thanks! they happen. At least usually they are not too bad. Here are some pointers for making the crash a a little bit less painful and injury filled. While still on the bike, if you are approaching a pile up or see the issue unfolding, look for possible exits. Concentrate on the holes and gaps between riders and things rather than staring at people falling on the ground. If you see a small gap between a rider and his bike, steer for that gap and try to squeeze through. All the while, scrub speed as possible in case you do not make it through. If you know your going to crash, at least do your best to point into flat areas, its better to crash into a rider on the road and land on pavement rather than pointing to light post on the side of the street. Most crashes in crits are not too bad, usually just a bit of lost skin. Aside from flopping poorly on the ground, most major injuries are sustained when a rider crashes into a fixed inanimate object such as light post, parking meter etc. These small hard fixed objects put all the forces of the impact into one small space and stop you suddenly. Hitting a broader surface and sliding out(as in landing in the middle of the road) is much less devastating. So if you have any chance to steer around something, point towards open flat areas and away from vertical fixed objects as best you can. Scrub whatever speed you can, if you have time to slow a bit, losing a few mph while your still on the bike will be preferable to losing that mph while sliding on the ground using your skin as the brakes. Especially if hitting an object is going to happen. If you are cornering, hitting the brakes hard is going to cause the wheels to lock up and you will start to slide out. Come up out of the corner, point the bike a bit straighter and hit the brakes. Just be cautious what coming out of the corner will be setting you up for going straight into (see the above paragraph…). Sometimes just going down in the corner will be a better option than crashing into something at the exit of the corner. So, you have tried losing speed, going around, or the crash was just so sudden you didnt have time to think, you are now flying through the air and about to hit the ground. Your best bet is to tuck and roll as much as possible. Tuck your chin into your chest as much as possible, this will help minimize whiplash from hitting things, and help bring your head in so it is not flopping around smacking the pavement. Especially important if you land on your back. If you are erect and head out, you are going to smack your head into the pavement, increasing likely hood of concussion or neck injuries. Keeping your chin tucked in allows you to roll back a bit more rather than having your head hit full force into the pave. Its counter intuitive, but try to avoid catching yourself with your arms. If you go down and are falling and put your arm out to catch yourself directly in front of you(like a push up position) this is the motion that will most likely cause a dislocated shoulder, as the humerus will get pushed back out of the socket, or the forces will go into the scapula and cause issues here. If you put your arm out to the side(such as making a T with your arms out away from your sides) this can contribute to a broken clavicle as your humerus will get pushed up upon falling, leaving all the forces into the collar bone. Broken wrists/hands/arms are also greatly increased in this position as this puts all the initial impact into one small exposed portion of your body, all the impact goes into the wrist and hand, up the arm and into the shoulder. Direct hits to the shoulder, especially in downward or down & back impacts will also increase likely hood of breaking the clavicle(collar bone). Tucking and rolling, aiming to roll onto your back or side, will help decrease the initial impact. Tucking and rolling helps disperse the impact and smooths it out as you hit the ground, allowing the forces to go get dispersed, making the impacts less on particular points of your body. You may have a few more sore spots and small bits of road rash in some multiple places, but being a little sore everywhere for a few days is much better than nursing a torn rotator cuff for the next 6 months. Of course there are times where greater injury is unavoidable, but I know all of my crashes would have been much worse had I not known how to take a fall well. For learning how to roll well, enroll in a Judo or Aikido class for a few months, these two martial arts involve lots of falls, and learning how to roll and take a fall is a big part of starting them. You may never encounter thugs and need to use your new found ninja skills to fend off attackers, but if you intend to race bikes, the skills of falling may greatly reduce your chances of serious injury. If your interested in learning some basics of how to roll, let me know and I would be happy to show you some rolling basics. Previous PostCyclocross warm up tipsNext PostOff Season Training has begun!